It usually takes quite a bit of trial and error and experience to figure out the perfect set list. You can’t necessarily control how your audience receives your music, but you can definitely control the presentation in a live environment. Part of presenting your music well is having an effective set order. There are only so many variables you can control, but what you can control, you should be aware of. 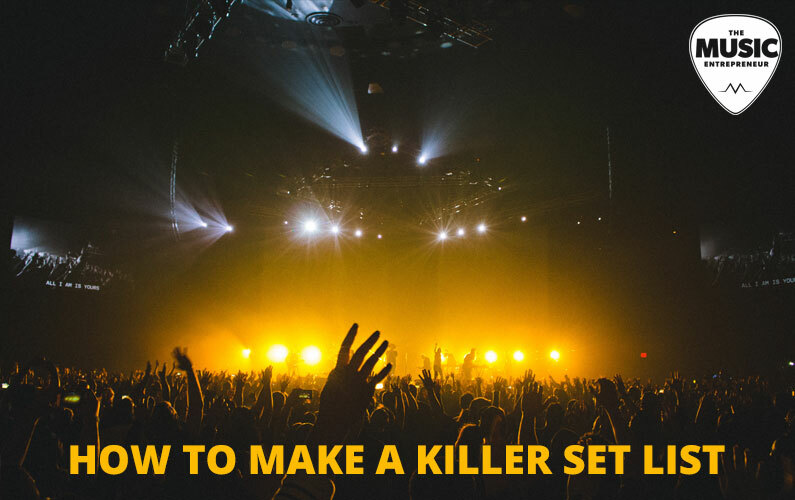 Here are some tips to help you develop a killer set list. Here’s an obvious but sometimes overlooked way to develop your set list. Before you go on stage to perform, try running a dress rehearsal (even a few days before) and see how your songs flow together. Identify problem areas and make adjustments accordingly. Don’t just wait for the day of your show; consider the venue size, allotted set time and audience mood/size and factor in those elements as you hone your set list. The temptation might be to lump songs with the same key signature together in your set list. In some instances, this can work (medleys, for example), but as much as possible, it’s a good idea to separate these songs and slot them in at different points in your show. Audiences can grow tired of too much of the same, and while they may not be able to describe it with exacting technical jargon, they will notice when songs sound too much alike, and boredom will begin to set in. Regardless of whether you’re a heavy metal band or a jazz band, a good way to create some flow and variety in your set is by varying up the tempo. Again, this is a matter of creating some distance between slower and faster songs. Don’t play too many slow songs in a row, and don’t play too many fast ones together. A good rule of thumb is no more than two or three of each at any given time. Don’t forget that you can have songs with moderate tempo either (many bands only have an on or off switch, so try to develop a few in between songs). Finally, try not to fall into the trap of playing every song at the same speed. Most musicians have a “comfort zone” when it comes to tempo, so you won’t stray too far from home base unless you make a conscious effort. Naturally, you want to begin the night with good energy. It can set the pace for the rest of the night. However, it seems that most people don’t generally remember the first song at a concert as they are getting acclimatized to their surroundings. It’s still a good idea to have an upbeat number at the beginning of your set, but you may want to space out the rest. Put one in the middle to break things up, and build to a giant climax at the end. Your set list should have a good flow to it. Think about how you can take your audience on a musical journey. If you only have one type of song, not only is it hard to keep their attention, there isn’t a whole lot you can do to make your set list better. Create songs with different feels, different rhythmic patterns, different key signatures, different tempos, and don’t be afraid to incorporate different musical genres either – even if you don’t normally venture outside your established musical style. Sometimes creating contrast between songs (i.e. going from a fun, happy, upbeat song to a pensive, sad song) can be an effective technique as well. Earlier this year, Goemon5 talked about how to determine the track sequence for an album, and his points are totally valid here too. The same general principles that make for good flow with an album also apply to live music. On a semi-regular basis, you should consider writing new songs and adding them to the set list. This gives you an opportunity to swap out old standbys with songs you may not play as much. Of course, there will always be staples in your song order, but changing things up from time to time should help to keep things fresh for you and your fans. Don’t be afraid to take risks or try different things. Leave space in the music for improvisation and exploration. Try creating live arrangements for your songs. Try different set orders from night to night and see how the audience responds. Continue to venture out of your comfort zone, and make tweaks and improvements to your set list as you go. Additionally, there might be good reason to keep your songs to a certain length for your album cuts (i.e. for radio), but you can – and should – give your music a little more room to breathe in a live situation. If you typically need to keep restrained in the studio, then let loose live. Let your intros go on for longer. Add more instrumentals or solos to your songs. Prince certainly did. This might mean playing fewer songs if you need to keep your set to a particular length, but you’ll leave a better impression on your audience, as it gives them a chance to hear something they haven’t already heard on your albums or singles. Finally, you need to be thinking about the visual aspect of your performance. Your songs might all sound different, but if they don’t look different, and feel different, you might as well be playing the same song over and over. If you have stage lights, that’s a good way to keep things interesting, even if you’re tied to your instruments or microphones. But unless you can’t move at all, I would suggest working on your stage moves in practice. Jump up and down during upbeat songs. Bring out a stool for slower songs. Physically turn your body towards the person who’s playing a solo when it’s their turn to let loose. These small changes can add up and make your live show that much better. You might come away amazed. A set list is a living, breathing thing, and there isn’t necessarily an end to the improvements you can make to it. Your goal should be to give your best on any given night, and leave the audience wanting more. Do you have any thoughts on what makes a killer set list? What strategies do you use to create an amazing experience for your audience?